Around the world, branches are undergoing transformation as consumers go online or on-mobile for their banking. As banks undergo digitisation and digital transformation, the number of brick-and-mortar branches are shrinking. For example, the number of Bank of America branches in the United States has fallen more than 20% to around 4,700 over the past five years. 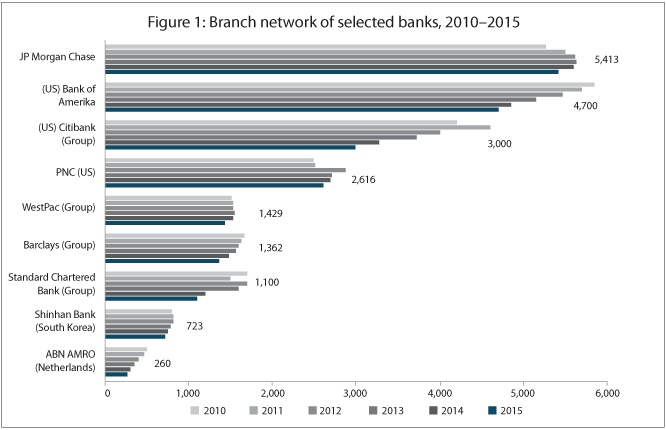 Netherlands’ ABN AMRO closed even more, shutting 46% of its branches between 2009 and 2013 (Figure 1). Although branches won’t disappear anytime soon, those changes reflect customers’ preferences for digital processes. Banks are undergoing dramatic shifts through branch transformation – something that has an impact on front-line sales staff and the back office. Globally, banks are using a multitude of new digital branch services to encourage customers to shift to self-service, take transactions out of the branch, grow revenue, and increase efficiency. To undertake this digital transformation effectively, banks have been analysing current practices to find out what actually happens at their branches – including what customers do. They are also studying how they can use digital technologies to make interactions and processes more efficient. Beyond the layout and new technology, banks found that branch transformation requires other changes such as new human resources (HR) practices and consumer education. The transformation actually starts even before customers reach the branch. A significant percentage of customers today go online or on mobile to do research before they even visit a branch (Figure 2). Banks are improving the pre-branch experience of customers, offering options such as scheduling the visit or beginning the account application process online. 40% of new accounts at leading banks last year were sold outside of the physical branches, according to BCG, while 71% of customers at top-quartile banks are now signed up online. Banks are actively seeking ways to maintain their distribution reach while lowering the costs. Some of their strategies include reducing the number of branches, pioneering lower-cost formats, developing video capabilities, and deploying hub-and-spoke models for full-service or self-service. Wells Fargo and PNC Financial Services in the US, for instance, have been testing video tellers, cash recyclers, and tablets so that they can convert their branches into sales and service hubs. However, these new formats require high-level support for paperless services, remote support from specialists through videoconferencing, and pre-booked appointments. In Poland, according to Cisco, mBank’s Light branches are located in high customer traffic areas such as malls. Along with interactive touch-screens with video and digital signage and content, mBank’s Light branches use video cameras and analytics to gauge the age, gender, and gestures of customers. The bank uses this data to tailor promotions and services to the individual needs of its customers, who receive personalised insights on touch-screens or connect with remote experts in a private video room. These initiatives have resulted in higher sales, which are three times the amount generated by traditional branches. In India, the State Bank of India (SBI) established digital banking branches in urban areas to connect with younger customers. These smaller branches allow SBI’s customers to interact with remote experts on video or interactive displays through online kiosks. Using these kiosks, consumers can open accounts, receive debit cards in ten minutes, obtain instant approval for home or auto loans, meet with virtual advisors, or learn about financial planning on interactive touch-screens. A large part of the gain in efficiency comes from customer self-service initiatives that use digital technologies. Banks are encouraging self-service for basic needs while reserving other channels for more complex services and relationship-based selling. To entice customers to use self-service digital channels, banks are promoting digital awareness. They also provide rewards such as higher interest rates for savings products that customers operate exclusively online. On the other hand, some banks use disincentives, imposing fees for transactions undertaken in physical branches which could have been conducted using digital channels. In South Korea, for example, Shinhan Bank has installed multi-functional self-service kiosks that can complete almost 80% of teller transactions. Customers can use the kiosks to open an account, obtain debit cards, print bank statements, manage funds, and pay fines or taxes. The bank authenticates the customers’ identity through their identification card, a one-time password (OTP), or biometrics such as palm vein scans. Likewise, Banco Bradesco in Brazil also brought digitisation to its branches by introducing interactive touch screens, biometric login capabilities at automated teller machines (ATMs), and digital avatars that offer personalised financial advice. The Bradesco Next branch in São Paulo also has interactive tables that customers can connect with by using their e-banking app. In Turkey, Kuveyt Türk Bank installed a new generation of ATMs to reach remote areas, rather than constructing traditional branches. Customers can use the ATMs to open an account, apply for a credit card, receive a debit card, or handle cheques. The cost is about 90% lower than a new branch. 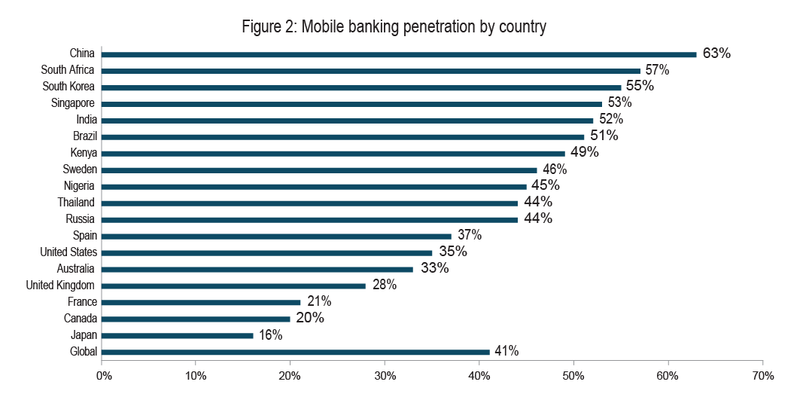 McKinsey estimates that more than 700 million consumers in Asia use digital banking regularly. Furthermore, 92% of customers in developed Asia have used internet banking since 2014 and 61% have smartphones for banking services. Very importantly, recent research from McKinsey also showed that customers accept these changes. The future of branches is about focusing on advisory and consultation rather than transactions. Citi forecast in its 2016 Digital Disruption report that customers will likely stop interacting with branch staff for transaction-related services but will still meet them for more complicated issues or products such as mortgages. To prepare for this shift, banks are resizing, repositioning, and reenergising their branches. They are also using digital tools to help staff identify customers’ needs, cater for different customer segments, and provide customised recommendations. a paperless application process can be used to open an account or complete a loan application. The Retail Workbench platform increased sales by 36%, while sales staff increased productivity. In the UK, Barclays rolled out iPad devices across its branch network so that staff can work wherever their customers are. Branches have also been re-imagined, offering services such as free wifi, coding classes, digital education, and digital briefings for small and medium enterprises (SMEs). In addition, banks in Japan have augmented staff with robots to allow their staff to focus on other interactions. Mizuho Bank’s Pepper robot converses in several languages and combines sensors, video, analytics, and cloud-based artificial intelligence. It can “learn” and adapt through the course of an interaction, and employs facial recognition to remember individual customers. In general, alternative formats that focus on digital self- service for transactions and advisory services for high- value transactions have already proven to be profitable. Nordea Bank, for example, reduced its cost-to-income ratio from 60% to 56% after it began focusing on advisory services. While much is changing in the front office, there is also a tremendous change happening in the back office. BCG, in its Global Retail Banking Report 2016, said that leading banks are reducing the cycle times for core processes such as opening accounts, achieving higher rates of straight-through-processing and improving productivity. Banks are also starting to use robotic process automation (RPA) for services such as client onboarding, verification, product processing, and payment processing. EY partner Liew Nam Soon said that banks are already getting robots to operate at one-sixth the cost of an offshore worker, and they are achieving cost savings in the back office of 50% to 70%. These shifts have resulted in lower numbers of branch staff, with an average reduction of 2% every year. Citi has forecast that there could be another 30% reduction in staff between 2015 and 2025 as a result of further automation. While the gap between leading banks and smaller banks is growing, even median players can reduce operating expenses by 15% to 25% and increase pre-tax profits by 20% to 30%. These changes have resulted in significant declines in the number of branches in many markets (Table 1). Aside from the branch closures at Bank of America and ABN AMRO, Nordic and Dutch banks have also cut their total branch levels by about 50%. Norway’s DNB, for instance, announced that it would further halve its branch network this year. Citi expects that banks in developed markets will reduce branch numbers by around 30% to 50% from 2013 levels. Aside from this reduction, banks may move more branches to residential areas, using geo-spatial analysis to select the best locations and formats ranging from small self-service units to large flagship branches. Operations are being shifted from branches to operational factories or specialised suppliers. The results can be significant. Nordea Bank increased its income from $5.1 billion (€4.8 billion) to $6.0 billion (€5.6 billion) after it reduced the number of branches by 50%. The bank also shifted its branches from street level to the second floor of buildings. One example of a bank undertaking branch transformation is the Bank of East Asia (BEA), which has been digitising its existing branches. It has also created fully digital branches that can be as small as about 200 square feet. These digital branches bring together components that include the i-Teller, a video interface allowing customers to talk directly with remotely-located staff; the i-Kit, which uses optical character recognition (OCR) and digital signatures to automatically complete application forms; and the i-Window, an all-in-one interactive aide for financial planning. BEA is in the midst of developing biometric authentication, including fingerprint and facial recognition. In addition, the bank has been using data analytics to enhance customer experience as well as to give BEA a more accurate profile of customer behaviour to anticipate new trends. With about 90% of transactions now processed through e-channels, BEA told The Asian Banker that the role of the branch has fundamentally changed – shifting from handling routine banking tasks towards attracting new customers, building relationships, and facilitating complex transactions. The bank’s employees in its digitised branches assist and educate customers on how to make the most of the new technologies. In general, customers have been very happy with these improvements. An internal customer survey in 2016 showed that 86% of respondents rated the overall digital branch experience as either good or very good, and 74% found that digital branches are better than traditional branches. Metrics have also shown digital branches outperforming, BEA said, with the take-up of SupremeGold accounts for high-end customers increasing by 20% at digital branches, investment accounts by 19%, deposits by 15%, young customers aged under 35 by 12%, and professionals by 15%. Today, 39 of BEA’s branches across Hong Kong are now digitised and the bank aims to digitise its entire branch network by 2018. Westpac New Zealand has announced that it will be closing 19 of its branches. A bank spokeswoman said customers have rapidly changed the way they bank, with more than 85% of transactions taking place outside of a branch. Over the last five years, online transactions increased by 61%, while online logins via a mobile device increased by 33% last year. The bank intends to mitigate the loss of services by leaving the bank’s ATMs in place, providing a cash deposit box for businesses, and placing a public computer for internet banking. The transformation of physical branches has been happening faster than what many have expected, and this change has major impacts. Banks that transform effectively can reduce costs, increase efficiency, and raise profits significantly. At a time when there is increasing pressure from investors and regulators to improve effectiveness and efficiency, branch transformation provides a powerful tool to make the needed changes. For many years, a number of banks, particularly in emerging markets, have questioned whether customers will accept the changes and if the cost-benefit equation for digital branches will be positive given the high investment needed. The results from banks in emerging and developed markets show that, as long as the strategies and processes leverage best practices, the answer to this question is “yes”. Leading banks that are transforming their branches are powering ahead, while laggards face the risk of being left further and further behind.